After four long days of poker, Event #35: $10,000 Heads Up No-Limit Hold'em Championship has a winner with Ayaz Mahmood being crowned champion! Some of the greatest heads up players from around the globe took to the felt to form the stellar 256-player field. Online stars such as Tom Dwan, Dani Stern, Andrew Lichtenberger, Issac Baron and Brian Roberts, along with seasoned veterans such as Daniel Negreanu, Barry Greenstein, Howard Lederer and Andy Bloch all bite the dust before day two as only sixty-four players returned being only one match away from the money. Phil Ivey, Jonathan Little, Steve Gross, Brock Parker, Terrence Chan and the always lovable Gabe Kaplan were just a few that fell short of the minimum payday as only a final eight would remain after Sorel Mizzi, Scott Clements, David Williams, Phil Gordon and Bertrand Grospellier all exited just shy of a day three berth. The final eight were led into the (expected) final day of play by Vanessa Rousso who already has a second-place finish at the 2009 NBC Heads Up Championship on her poker CV. Unfortunately for Rousso, and five of her counterparts she would fall short of the final as Ayaz Mahmood and Ernst Schmejkal would feature in the final battle of the tournament. 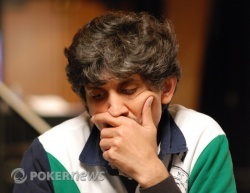 With the previous round matches all flying by in quick time, their first round match would last well over six hours with Mahmood proving victorious after crippling Schmejkal in a hand at roughly 5am in the morning, before dispatching of him just two hands later. Returning today the pair continued their see-sawing battle with each soaring out to a lead before having it pulled in by their opponent until Mahmood would finally hit an all-in runner-runner straight for Broadway - just before the match ticked into hour five - to send Schmejkal to the rail in second place. For the 38-year-old professional poker player currently living in Houston, Texas, this does not only represent his eighteenth WSOP cash, but also his first bracelet after several previous visits to the final table. 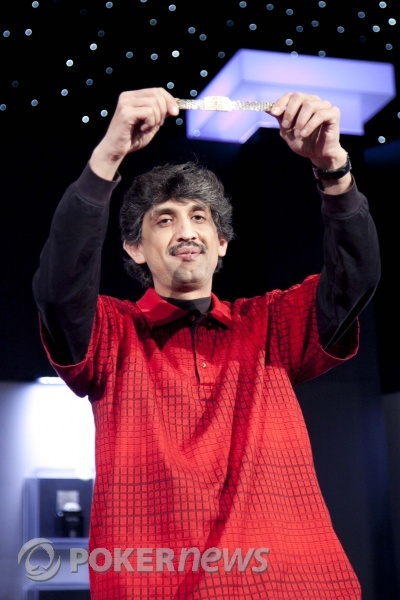 Defeating John Duthie, Nathan Doudney, James Collopy, Kevin Saul, Brian Rast, Faraz Jaka, Jason Somerville and Ernst Schmejkal, Mahmood displayed a great deal of poise and patience, mixed with timely aggression and composure to see him crowned the Event #35 champion, recipient of $625,682 in prize money and owner of a coveted gold bracelet. 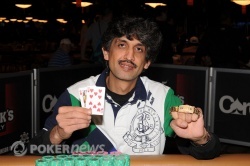 PokerNews would like to congratulate Ayaz Mahmood on a fantastically played tournament as well as achieving the proud accomplishment of capturing his first WSOP bracelet! Here is the Event #35 Champion Ayaz Mahmood! Ernst Schmejkal Eliminated in 2nd Place ($386,636); Ayaz Mahmood Wins! Ernst Schmejkal opened to 250,000 from the button and Ayaz Mahmood made the call to see a flop fall. Mahmood checked and Schmejkal fired out a bet of 250,000 only to have Mahmood check-raise to 600,000 total. With the action on Schmejkal, he sat deep in his chair contemplating a decision before quickly popping up and reaching for two stacks of green 25,000-denomination chips amounting to 1,000,000. Looking down at them behind his dark sunglasses, Schmejkal slowly slid them into the pot only to have Mahmood instantly announce he was all in. 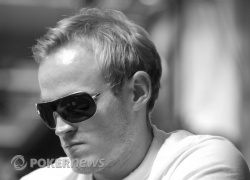 With only 1,455,000 remaining in his stack, Schmejkal made the call to put his tournament life at risk. With Schmejkal in the lead, and in great shape to grab a stranglehold of the match, the dealer peeled the on the turn to extend Mahmood's outs to a total of thirteen. As the twenty or so people watching on pressed hard against the rail, the dealer slowly burned and turned the on the river to complete Broadway for Mahmood. 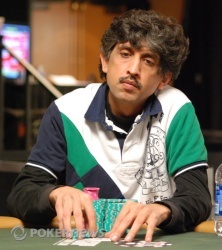 In an instance the Pakistani-born player leapt from the stage nearly tripping over as he high-fived and fist-pumped his nearby supporters as Schmejkal just sat there emotionless as his bid for a WSOP bracelet had fallen so close. Fortunately for the German, now located in London, Schmejkal will be heading back across the North Atlantic with $386,636 in second prize money as Ayaz Mahmood is crowned the Event #35 Champion! Ayaz Mahmood made it 300,000 to go from the button and Ernst Schmejkal made the call. The flop came down . Schmejkal checked, giving Mahmood the decision. He bet 400,000 and Schmejkal promptly folded. Ernst Schmejkal opened to 300,000 from the button and Ayaz Mahmood made the call. Mahmood checked the flop and Schmejkal fired out 225,000 only to have Mahmood click-it-back to 450,000. Schmejkal took his time before releasing his hand. Both Ernst Schmejkal and Ayaz Mahmood have agreed to take a 60-minute dinner break with 28 minutes remaining in the current 60,000-120,000 level. After capturing a few big blinds and small pots, Ernst Schmejkal will be taking the chip lead into dinner break. Play will resume at 12:30 am PST. Ernst Schmejkal made it 250,000 and Ayaz Mahmood called. The flop came down . Mahmood bet 275,000 and Schmejkal called. The fell on the turn and Mahmood bet 450,000. Schmejkal raised all in and Mahmood instantly folded. Ernst Schmejkal opened to 240,000 and Ayaz Mahmood made the call. The flop came down and both players checked. The turn brought the and Mahmood bet 350,000. Schmejkal folded and Mahmood raked in the pot.